For everyone interested in improving their chess playing skills we highly recommend reading an article by an experienced Russian trainer Irina Mikhailova. There, she explores the possibilities computer technologies open, offers a detailed two-year plan for achieving ELO 2400 and gives advice on what courses work best for each stage of training. CT-ART: Mating Combinations is a new training course. The “CT-ART” label indicates that it is a tactics training course, but more importantly that it is of the same quality class as the original and popular CT-ART. The author of this new training course is Victor Khenkin, an experienced and respected chess coach. As all new training courses, Mating Combinations runs in the Peshka interface as shown in the following graphic. 12th and 13th World Champions Anatoly Karpov (2619) and Garry Kasparov (2812) will play match in Valencia, Spain from 21st to 24th September. Match format: 12 (4 Rapid and 8 blitz) games. Time control: rapid: 25 min + 5 sec/move, blitz 5 min+2 sec/move. Games start at 18.00 GMT. ChessOK is going to broadcast all games of this tournament with Rybka 3 Aquarium commentary. In April 2009 I wrote an introduction to Peshka@, the new ChessOK training and improvement framework. Since then the ChessOK developers have been hard at work, not only completing its development, but also converting existing courses into the new Peshk@ format. This means that the whole ChessOK training catalog will be available for Peshk@ upon its release. These days it’s hard to keep up with everything that is happening at ChessOK in a monthly column. In recent months the focus has mostly been on Rybka Aquarium, but now they have a brand new product, Peshk@, which is to be released soon. It is a welcome addition to their long line of respected training and improvement programs. Many readers are probably familiar with ChessOK training programs, such as CT-ART, Chess Tactics for Beginners etc. Peshk@ (”peshka” is the Russian word for “pawn”) is a completely new product, with a modern user interface and new features. The clearest indication that Rybka 3 UCI & Chess Openings 2009 is much more than a regular onevolume reference work on the chess openings is in the title itself. 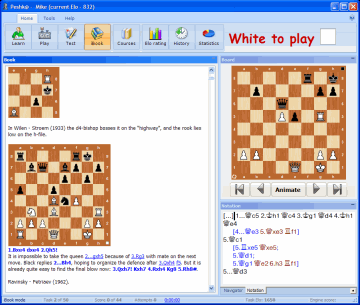 For this program includes Rybka 3, by far the strongest chess engine available. This month I will discuss the different tools that the program offers for viewing and studying the theoretical material, and next month I will take a look at some additional features, including using Rybka for analysis. The idea of the article is as follows: it is very important to study tactics and it is better to do so with the software of our company. Why shall we study tactics? One of the most important components in chess player’s skills is tactical vision. It’s impossible to achieve high results without mastering this art.